“I went and had a bone scan at a clinic once,” he says. It’s eight p.m. on Sunday night and we’re doing the second top-to-bottom clean of the dojo for the week. He’s pushing a mop at one end, I’m down the other and our conversation carries across the middle. If you can know a man by his habits, then Peter Graham is both meticulous and disciplined. It’s easy to believe; from all the way across the dojo, it’s clear to see that Peter has joints like a horse. 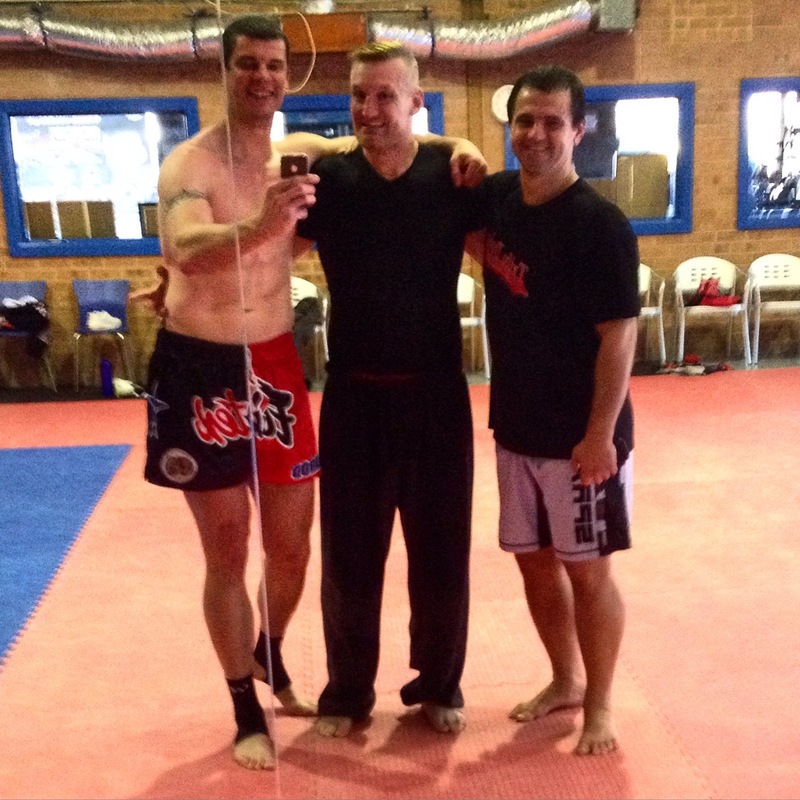 Peter Graham’s IMC, or International Martial Arts Center, is located in Prospect, in the outer suburbs of Sydney. I’ve flown up from Melbourne to stay with him for a week to watch him train. At the end of that week we will depart for Gdansk, Poland, where he will take on Karol Bedorf on KSW 31. 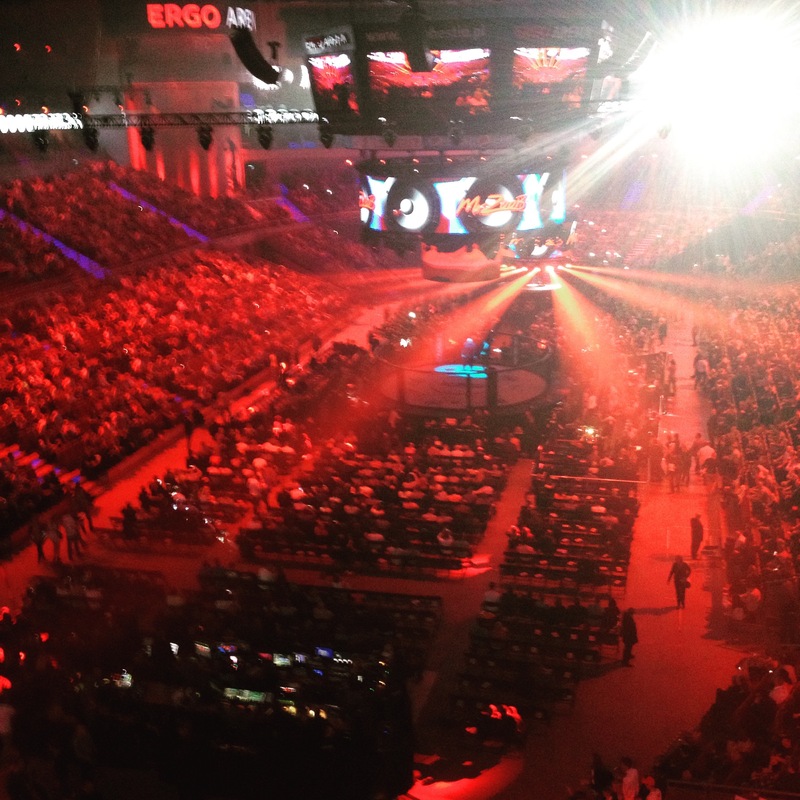 KSW is the Polish MMA promotion known for the largest, grandest shows in Europe. 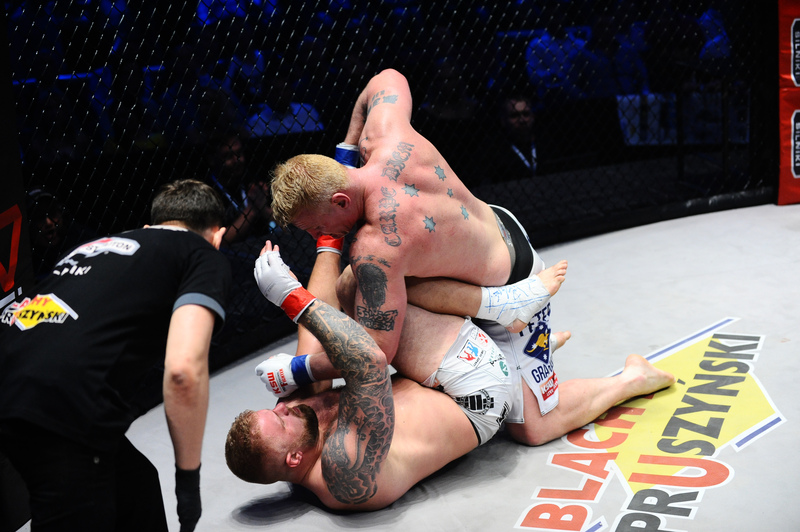 Peter quickly became a fan-favorite after demolishing tattooed behemoth Marcin Różalski on KSW 30. Rozalski, six and a half feet tall with more tattoos than available skin, would frighten the blanket off your bed. Bedorf is a step up from Rozalski, however; Bedorf hasn’t lost a fight in three years. “It’ll be the biggest show you’ve been to,” says Peter. The next morning is an early start. Peter has a mix of training partners that come in to help out. Boxing trainer Barry Raff is holding focus mitts, I’m on the Thai pads and Daniel Trifu, Kyokushin karate ace has come down to move around, as well. Both Peter and Daniel do three five-minute rounds with Barry and myself – in line with the duration of the KSW rounds – and then Daniel, Peter and myself pad up for sparring. I don’t become frightened when sparring people of Peter’s caliber. To begin with, throwing anything at all is a win in itself. And my strategy for the morning consists of keeping my hands up in front of my chin. That’s about as sophisticated as it gets. Daniel and I did a few rounds to begin with. He’s what you’d expect from a Kyokushin fighter of his pedigree; strong, hard, and straight. All three of us are ex-Kyokushin fighters that have moved into kickboxing, so we’re working off the same basis with varying degrees of sophistication. While I didn’t enjoy boxing, it improved my kickboxing almost immeasurably, and the golden rule that I learned is, ‘keep your hands up’. I repeated that to myself like a mantra as Peter climbed through the ropes. I find Peter difficult to spar because his pedigree is overwhelming. He has fought – and prevailed against – most of the K1 stalwarts. I sat ringside in New Zealand and watched him defeat Badr Hari, as well as his five-round fight against the most fearsome kickboxer ever, Semmy Schilt. Most people were lucky to survive three rounds; on New Year’s Eve 2006, after five rounds, Peter took Schilt all the way to decision. Watching Pete while we spar is a remarkable thing. He’s one big dude, his weight sitting naturally around 115kilograms. Yet, for all that size, he’s remarkably agile. His footwork is precise and elegant, and always allows him to transition gracefully from one posture to the next. He works his levels; I get hit on the thigh, then the head and then the stomach and straight after, up comes the high kick. I’m three inches taller than Pete, but his hips open and the kick is not a reach; the leg comes through, carrying the hip behind it and I lift my hands and lower my head to let it pass over and do my best to hit him back. Part of the difficulty with sparring him is that his form is so developed and refined after close to twenty years of fighting at the highest level, you want to watch; there is no better position to see form of that quality. You can’t afford to watch as a spectator when you’re an opponent, or you don’t see the things you should. As they say, ‘The one you don’t see is the one that knocks you out’. We get to the end of the round and I’m happy I’m shaking hands, rather than lying on the canvas, wondering how I came to be staring at the ceiling. The author, Peter Graham (center) and Daniel Trifu (right). It turns out that the ‘media training’ is to be held in Stalin’s building. The building bespeaks its history as a monument to a despot; soaring halls of marble are lit by chandeliers of oak leaves and wall sconces in a peculiar Baltic rendition of the art-deco style. I wondered what Stalin would make of the legacy of communism in Poland had he been in attendance. The banners at the front of the room bore looming images of each of the current KSW champions: lightweight Maciej Jewtuszko, middleweight Michal Materla and heavyweight Karol Bedorf, Peter’s opponent. All three fighters are Polish. Peter is a big man, but Bedorf is bigger again, carrying a lot of suspiciously bulbous muscle mass around his shoulder girdle. Peter shakes his hand and jokes with the younger fighter as well as he can over the high fence of the language barrier. Peter’s reputation as a striker casts a long shadow of its own and Bedorf seems uncomfortable, standing as he does in the eddies of its reach. The media training is soon to begin, so the fighters file backstage, behind the banners. Peter changes into his fighting trunks and puts his hands against the wall while he does some dynamic stretching. He is silent and focused, careful not to look at Bedorf, so their eye-contact doesn’t create a flashpoint. Bedorf sits and resolutely stares straight ahead. His sparring partner, Jedrzej Mackowlak, is even more outsized. His head looks like a box. His nose is fixed on the front corner edge while his little ears, closer to the top of his head than his mother would have put them, make every other aspect of his six and a half foot, 117kg frame even more cartoonish in contrast. The fighters are instructed that they have five minutes to show their quality to a media scrum that bristles with microphones and cameras. They come out with partners and trainers and move through a haphazard selection of padwork and partner drills. The displays are largely sketchy, and the fighters often miss their marks and misstep. An experienced observer understands this isn’t because of a lack of quality; it’s due to a lack of warm up, followed by a combination of unfamiliarity and nerves. When a fighter has someone opposite them trying to knock them out, it forces them to abandon their distractions and focus on their job – and the pain. With no such incentive, the fighters are clearly distracted by how they look. Peter and his trainer, Larry Papadopoulos emerge for their five minutes and while Larry inspects the equipment, deciding what to do, Peter loosens up with some shadow. It’s just a warm up, but to a crowd, shadow is the best way to see a fighter’s quality. Peter’s co-ordination, balance, footwork, technique and the ability to let it flow as a natural expression is as plain to see as the fluid, cursive shadow that rolls across the floor. The photographers sense their moment and start working. The rhythm of the shutters increases with the speed of Peter’s movement. Peter trips on a join in the mats and says something to the press. Because the great marble hall gathers all sounds into a rolling echo, I can’t hear what Peter has said. But the press assembly laughs as a group, effectively catalyzing the tension into laughter. Peter’s training session proceeds as a workout in structure, during which he demonstrates each aspect of his game. At the end he bows to the press and with a smile and a wave, he and Larry return backstage. Many of them applaud, and you can their hear appreciation for making their job easy, as much as for the display itself. When Bedorf and Mackowlak emerge wearing sixteen-ounce gloves and shin guards, they perform a partner session of striking drills, along the lines of Dutch kickboxing. Bedorf is silent and determined and from the sounds, not to mention the expression on Mackowlak’s face, he is hitting hard. There is no talking or joking; their interaction remains closed. While the pre-fight interviews and media duties are performed in Warsaw, the show itself is to be held in Gdansk, down the bottom the country. Both Peter’s crew and Rolles Gracie’s are ferried down to Gdansk via minibus, which is a six-hour drive. Few of the fighters can effectively fit in the seats, given that the bulk of the crew is well over six feet tall. Peter doesn’t talk about his nerves; in fact, as the fight gets closer, he becomes increasingly taciturn. Some afternoons we go on long walks. The crew has been joined by a number of Peter’s friends from Australia. They come rushing into his hotel room the afternoon of the fight, full of excitement and enthusiasm after the mates-on-holiday triathlon of drinking, carousing and very little sleep. Pete is glad to see them and they him, but they don’t see what he’s doing, standing on the other side of the room, focused on the calm, methodical activity of folding his t-shirts. I take a photo; him on one side, them on the other, and the divide of blank space between. The noise of the iPhone shutter causes him to look up. He smiles. Peter was right; I haven’t been to a show of this size; not a fight show, anyway. The lights, sound and wall of visuals projected onto the screens that line the walls of the Ergo Arena make it feel more like a Pink Floyd concert. Local rapper Mr Zoob opens the show and the seats fill quickly, the stadium soon filled with its capacity crowd of fifty-thousand spectators. The monolithic Jedrzej Mackowlak is one of the undercard fights. His opponent is three or four inches shorter, and when the referee stands between them and gives his instructions, Mackowlak’s face darkens and his eyes draw down, like a shark’s. He hands his opponent a summary beating in little less than a round, leaving a single smear of blood on the white canvas, like a signature. 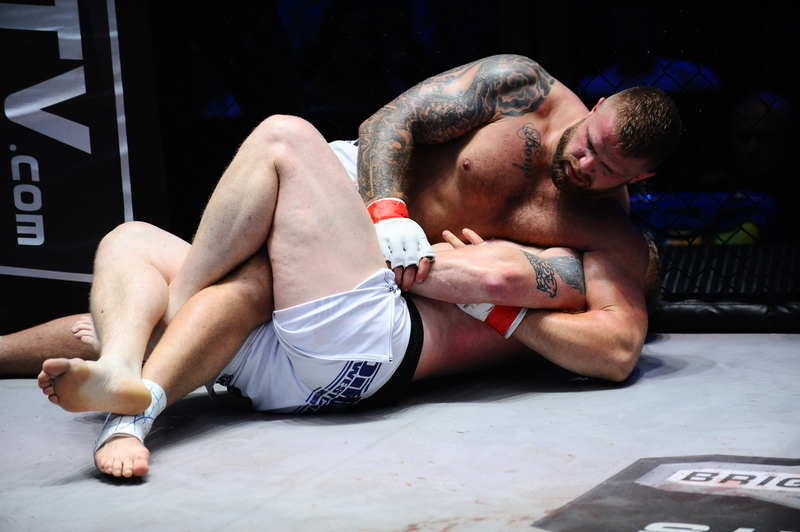 MMA is an unpredictable sport – possibly the least predictable – and for this reason, you can’t relax as a spectator. Given that things can turn in a split-second you have to remain attentive, or the climax of the fight may elude you. Further, the sport takes place on multiple battlefields, both vertical and horizontal, and you need to go from watching the live action to watching the screen to properly absorb the intricacies of the contest. Pete, as the semi-main event, is near the top of the card. He emerges to the sound of ACDC’s ‘Thunderstruck’, his entrance music for over a decade. Pete descends the gantry to a moving platform; he tells me later that it was a struggle to see it in the dark and he very nearly fell. Bedorf emerges shortly after to the more reflective, lyric strains of electro pop artist Bonobo. The referee gives his instructions as the two fighters stand close, eye to eye. The stare is the point of ignition, something both fighters have avoided all the days prior to now. The bell goes and they circle. Pete catches Karol with a couple of inside thigh kicks; the timing is dead-on and Bedorf goes straight for the take-down, pinning Peter on his back and trying to use a forearm wedged under his jaw to iron his body out straight. From where I sit, I can see Pete’s eyes on the overhead screen. He’s concentrating, working by feel to employ a counter. Again, the interface has returned to the impersonal. The round finishes with Bedorf on top, but unable to land a telling blow or take effective control. The second round starts out in similar fashion to the first. Karol wants to test his striking, and he soon finds himself catching a number of Peter’s hooks with his face. Peter finishes with a knee strike, which Bedorf turns into an opportunity for a takedown. Bedorf has a number of assets and great strength is clearly one of them; he patiently moves from side control and transitions to full mount. Once his hips are positioned on top of Peter’s chest, he opens up into ground and pound. It doesn’t look good, but Peter manages to shut him down and the rest of the round is spent in similar fashion to the first with Bedorf looking to establish control while Peter works from his back to foil it. The final round began standing. Peter landed a number of effective punch and kick combos and when Karol went in for the takedown, Peter timed his sprawl a little earlier and came down on top. Smelling victory, he held Bedorf in position and rained down hammerfists on his head. Karol was not in a good position, holding up one hand in what looked like near-supplication. All of us sensed the referee’s intervention; the cheering of the crowd rose in intensity, as did the clatter of keyboards in the media seating. When Peter’s hand-speed began to diminish, Bedorf flipped Peter onto his back and spread out his immense bulk, smothering him. Bedorf kept the fight on the canvas for the remainder of the round, maintaining position, but seemingly unable to exploit it to force a conclusion. After the final bell, a clear decision was made in Bedorf’s favor by all three judges. Next I saw Peter, I was milling around the media address area when each of the fighters came out for post-fight interviews. Some of them, particularly Tomasz Drwal, looked as if he’d spent his three rounds as a crash-test dummy flying through windscreens. “There you are,” said Peter, coming up behind me and slapping me on the shoulder. Aside from a bruise on one side of his face, he appeared unscathed. “What did you think?” I asked, and he shrugged his shoulders. Each fighter performed a short interview. My Polish is not particularly good, but the interviews with the younger fighters were simple Q&A. Peter knew his interviewer from his previous appearance, and they quickly settled into their established dynamic, with many of Peter’s answers coming as a kind of comedy. The day after, Peter returned to Australia. We shook hands in the driveway of the Novotel Marina hotel, before he got in a cab and drove away. I walked through the hotel grounds, out the back gate and down along the promenade that wound through the forest parallel to the seaside, considering my own profession; thinking of what it was I had to say. 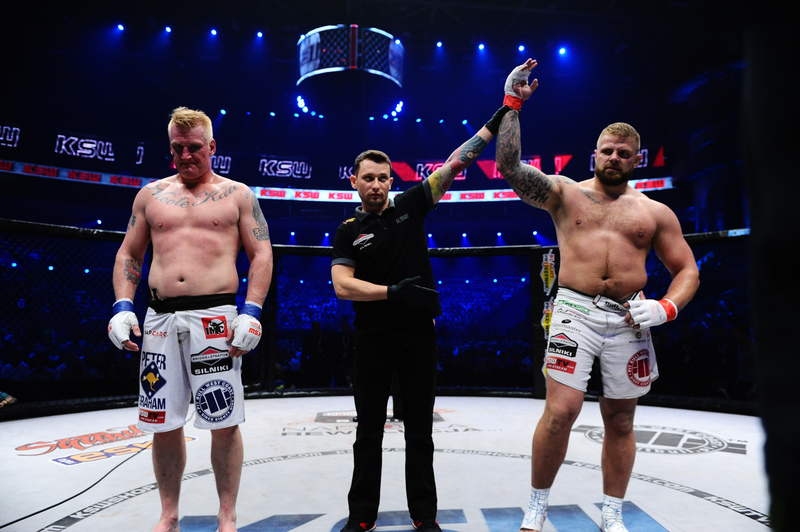 This entry was posted on September 17, 2015 at 4:31 pm and is filed under fighting, Journalism, Peter Graham with tags ACDC, Badr hari, Barry Raff, bone scan, Daniel Trifu, Jedrzej Macklowak, K1, Karol Bedorf, Kickboxing, KSW, Kyokushin karate, Larry Papadopoulos, Maciej Jewtuszko, Marcin Rozalski, MMA, Peter Graham, Peter Graham’s IMC, Poland, Semmy Schilt, Stalin, Thunderstruck, Tomasz Drwal, Warsaw Palace of Science and Culture. You can follow any responses to this entry through the RSS 2.0 feed. You can leave a response, or trackback from your own site.